Today, when many people are looking for natural remedies, energy healing for illness is perhaps the most natural home remedy of all. Because the immune system is so sensitive to thoughts, emotions, and subtle energies, energy healing for illness can be an extremely useful tool in strengthening your immune system, fighting colds, and speeding healing. And because it uses nothing external, such as a medicine, there is absolutely no danger of any side effects. 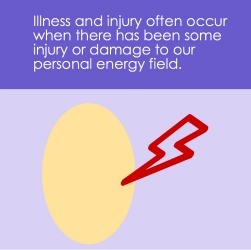 In my experience, illness and injury often occur when there has been some injury or damage to our personal energy field. Energetic prevention is thus the first line of defense. Take a few minutes every day (or as many days a week as possible) to sit quietly. Allow your breath to deepen, slow down, and become regular. Breathe all the way into the lower third of your lungs. If you do this, your belly will naturally move out when you inhale, and back in when you exhale. Be present in your body. Allow your attention to move through your body, scanning it for any sensations or feelings, or any thoughts, images, feelings that arise. Allow your shoulders to drop, your belly to soften, the muscles at the top back of your neck to soften, your face and jaw to soften. If there are any other areas of your body that are tense, to the best of your ability allow them to relax. Gently set the intention to take wonderful care of your physical body this day. Allow yourself to feel (pretend if necessary) the energy systems within your body all working perfectly, with the energy flowing freely, exactly as they are intended to do. You can work with whichever systems you want to, whether that is a physical system such as the immune or digestive system, or a more subtle system such as the meridians or chakras. (Note: You don’t have to get too “mental” with this—in fact trying too hard usually gets in the way. Just set the intention to feel the energy, and then gently and easily allow yourself to feel whatever you feel. For some people, this will be more visual, for some more of a feeling. It could even come to you as words, sounds, taste, smell, or just a knowing. Next move your attention to the space around your body. Allow yourself to be aware of any sensations or feelings, thoughts, images or feelings that arise. They may be very subtle. Allow yourself to feel (“pretend” if necessary) your energy become completely balanced and free-flowing. Allow yourself to feel any disturbances smoothing out, and any blocks dissolving. Again, don’t try to hard with this—just set the intention and then let it unfold. Feel yourself becoming very peaceful. Imagine yourself surrounded by a cocoon of light. It can be white, gold, blue, or any color that seems right to you. Visualize, feel, or otherwise sense it surrounding your whole body. Hold this for as long as it feels right, then set the intention to keep your field radiant and intact. Take a few more deep breaths, open your eyes, and go on about your day knowing that you will have all the health, strength and vitality you need to accomplish this day’s journey. In our family, when we feel a cold or the flu coming on, we use Donna Eden’s technique of vigorously tapping the thymus. The thymus is one of the main organs of the immune system. By tapping it vigorously with the fingers of both hands, you are energetically "waking up" the immune system. Even with the best energetic (and physical) self-care, our physical bodies sometimes get sick or injured. Here’s how to work with the energy to move the illness out of your field or to speed healing of an injury. Get calm, centered, and present in your body. With the palms of your hands, feel for any kind of disturbance or difference in the energy in the area the illness or injury has affected. For example, if you are having a head cold, scan the area around the nose and sinuses; if you are having a sore throat, scan the area around the throat, and so on. The feelings may be very subtle. If you feel a disturbance or difference in the energy, gently sweep your hands through the affected area of your field for as long as necessary until you feel the energy change for the better (e.g. the disturbance or difference resolves). You can also just hold your hands still in the area of the disturbance/difference until you feel a change. If you don’t feel anything in particular, just hold your hands over the area for a while, holding the intention to support healing. If you feel called to work in a different area of the field, by all means, do so--the source of a problem is often not at the site of the problem. Once you feel the energy change (or when it feels right to you), fill the area with light—white, gold, pink, or any other color that seems right to you. Alternatively, you may feel called to fill the area with a sound, taste, smell, or feeling. Or you may feel that the healing is already complete. Just do what feels natural, without trying too hard, as that is usually counterproductive. You may feel the desire to sleep, or to eat certain foods, or have some other strong sense of something that you should do. This is part of the healing, so follow your intuition. The intention to heal is always the most important element, so don’t get too hung up on the details! And don’t be discouraged if energy work for the illness doesn’t seem to have an impact. 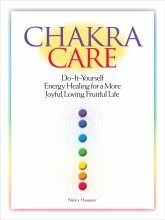 Energy healing has a much broader scope than physical remedies. Sometimes the healing may be on a different level than the physical body. For example, the illness itself may hold an important message for us, such as telling us to slow down, or to make a change in our life. In that case, the “healing” might be gaining greater clarity or awareness about the changes we need to make in our life. In the long run, a healing on the non—physical level might have more of an impact than one on the physical level. But--if the illness or injury is serious, worsens instead of getting better, or keeps hanging on—be sensible and see your regular medical provider! Energy healing for illness is only meant to complement conventional medical care. Return from Energy Healing for Illness to Immune System main page.